Vagrant has become the de facto tool for devops. Faster iterations, clean environments, and less overhead. This isn’t an article about why you should use Vagrant. This is an article about how to get up and running with Vagrant on Fedora with libvirt easily! This article is an update of my original Vagrant on Fedora with libvirt article. There is still lots of good information in that article, but this one should be easier to follow and uses updated versions of Vagrant and vagrant-libvirt. Vagrant ships by default with support for virtualbox. This makes sense as a default since it is available on Windows, Mac, and GNU/Linux. Real hackers use GNU/Linux, and in my opinion the best tool for GNU/Linux is vagrant-libvirt. Proprietary, closed source platforms aren’t hackable and therefore aren’t cool! Another advantage to using the vagrant-libvirt plugin is that it plays nicely with the existing ecosystem of libvirt tools. You can use virsh, virt-manager, and guestfish alongside Vagrant, and if your development work needs to go into production, you can be confident in knowing that it was already tested on the same awesome KVM virtualization platform that your servers run. Let’s get going. What do you need? I recommend hardware that supports VT extensions. Most does these days. This should also work with other GNU/Linux distro’s, but I haven’t tested them. I’m going to go through this in a logical hacking order. This means you could group all the yum install commands into a single execution at the beginning, but you would learn much less by doing so. Update: I’m actually now using vagrant 1.6.5, and you should try that instead. It should work for you too. Modify the below to match the newer version. Download Vagrant version 1.5.4. No, don’t use the latest version, it probably won’t work! Vagrant has new releases practically as often as there are sunsets, and they typically cause lots of breakages. Update: Typically we used to now have to install the nokogiri dependencies. With newer versions of vagrant-libvirt, this is no longer necessarily required. 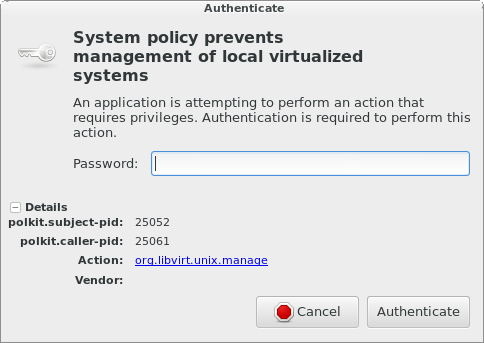 Consider skipping this step, and trying to install the vagrant-libvirt plugin without specifying a version. If it doesn’t work, try vagrant-libvirt version 0.0.20, if that doesn’t work, install nokogiri. Feel free to post your updated experiences in the comments! You don’t have to specify the –plugin-version 0.0.16 part, but doing so will make sure that you get a version that I have tested to be compatible with Vagrant 1.5.4 should a newer vagrant-libvirt release not be compatible with the Vagrant version you’re using. If you’re feeling brave, please test newer versions, report bugs, and write patches! You’ll notice that I’m using the systemd commands instead of the deprecated service command. My biggest (only?) gripe with systemd is that the command line tools aren’t as friendly as they could be! The systemctl equivalent requires more typing, and make it harder to start or stop the same service in quick succession, because it buries the action in the middle of the command instead of leaving it at the end! Your machine should now be setup perfectly! The last thing you’ll need to do is to make sure that you get a Vagrantfile that does things properly! Here are some recommendations. This typically gives me a 5x performance increase over plain qemu. This fix is available in the latest vagrant-libvirt version. The default has been set to KVM in the latest git master. I think this was fairly straightforward. You could probably even put all of these commands in a shell script and just run it to get it all going. What we really need is proper RPM packaging. If you can help out, that would be excellent! I hope this was helpful to you. Please let me know in the comments. This could be a post detailing how to host clustered virtual machines with rgmanager and clusvcadm, but that is a longer story and there is much work to do. For now, I will give you a short version including an informative “gotcha”. Whenever I think I’ve done everything right, but something is still not working, I first check to see if I can blame someone else. Usually that someone is selinux. Make no mistake, selinux is a good thing™, however it does still cause me pain.